Examine how PLCs provide the decision-making platform for the rigorous work of differentiated classroom instruction. 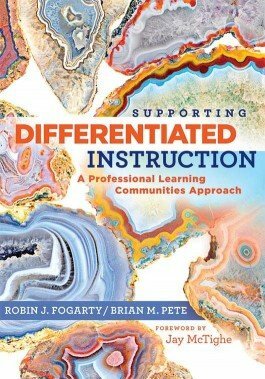 A practical guide to implementing differentiation in the classroom, this book offers a road map to effective teaching that responds to diverse learning needs. Takeaway objectives at the beginning of each chapter guide discussion, and each chapter ends with action options of highly interactive strategies. Utilize chapter takeaways to guide discussion for all teachers at all grade levels. Gain highly interactive action options to accomplish chapter takeaways. Use differentiated instruction in PLCs to maximize student achievement. Explore summaries of relevant theories and research on building teams, forging shared beliefs, dissecting data, attaining consensus, and teaching responsively. Because Supporting Differentiated Instruction is a guide to implement and support differentiation using a PLC approach, let’s make clear the connection between the PLC and differentiation. Teams functioning well within a PLC focus on what the students need in order to reach their potential. The purpose of this resource is to give the members of those collaborative teams ideas about how to better reach these students. Differentiation serves as the instructional umbrella for the kinds of decisions team members make to tap into the talents and needs of students. It is the overriding concept that dictates attention to what students need to know, and it continues to guide teachers as they consider what to do when the students know or don’t know it. We’ve designed the following chapters to help team members examine not just what they are going to teach, but how they are going to teach it. While it may be easy to create a list of dos and don’ts, it’s much harder to genuinely agree on, and adhere to, norms that ultimately serve the goals of the PLCs. The philosophy behind the creation of PLCs is that schools can’t keep doing things the same way they’ve been doing them in past; teachers have to come together and make student achievement the number-one priority. Thus, it would be the height of irony if the rules and norms created by PLCs were for something other than to ensure the success of the PLC’s mission. As teachers learn to embrace this idea, learning communities develop into productive, mature learning organizations. The Action Options in this chapter include ways to establish norms for the PLC and the PLC teams. The T-Chart activity facilitates a preliminary discussion. A second discussion facilitator is the Web of Concerns, which results in prioritized agenda items. In addition, visit www.allthingsplc.info/tools/samples.php to read inspirational PLC stories. Basic courtesy rules, such as “Start on time and end on time,” can be adopted by members without much discussion. Coming up with rules of operation may take more time, but the energy spent on these will serve multiple purposes and will lead to more successful PLCs. The facilitator’s job is to elicit ideas for working in the PLC team, help specify behaviors that will facilitate the team’s work, and transform these statements into agreed-upon norms. For example, when discussing the rule of respecting others, one member may describe it as, “Honoring the comments of all PLC members.” The facilitator then asks members to talk with a partner about what honoring comments looks like. “Respect” would not be the appropriate answer. Respect is an abstract idea that sounds good, yet is hard to put into action. A better response describes how respect looks in action. For example, “Making eye contact with the speaker” is an example of what it would look like to honor the comments of all PLC members. The facilitator summarizes, puts this on the left side of the T-Chart, and continues until there are four or five examples. This process is repeated on the right side of the T-Chart: “Sounds Like.” Accepted suggestions should be specific and clear. For instance, “polite and professional” does not answer “What does it sound like to honor the comments from all PLC members?” A better answer would be: “It sounds like, ‘That’s a great comment’ or ‘Good idea’ or ‘That makes perfect sense.’” These comments of acknowledgment say what they mean. Covering issues like basic group dynamics may seem rudimentary, but teams should tackle these early to ensure more productive and collegial sessions. Using the T-Chart activity to discuss and clarify behavior expectations will make the norms operational, which will serve the long-term goals of the PLC. This initial conversation, with a focus on creating and honoring norms that count, helps PLCs and their teams develop and mature as learning communities. With respectful and professional norms in place, and with input from each member, PLC teams can move from internal concerns to the real concerns of student achievement, goals, and common assessments. In addition, the T-Chart strategy can easily be transferred to the classroom. Examples of classroom applications for the T-Chart include: What does a good thinker look like and sound like? What does a scientist look like and sound like? What does a friendship look like and sound like? Teachers are probably the most pragmatic of all adult learners. They want their time to be well spent, so whenever they can learn a new strategy while engaged in the process of the PLC team’s work, they benefit. PLCs are effective when they focus on the success of students. When PLC teams spend too much time lamenting the role of public education in national, provincial, or state policies, they may steer off their desired course. If these issues cannot be changed or improved directly by the members of the PLCs, then the valuable time together is best spent improving student achievement. The PLC is not a forum to establish what can’t be done, but rather an opportunity to focus on what can be done and how to accomplish it. Setting an agenda of topics, concerns, and suggestions generated by PLC members is a powerful step toward dealing with these issues successfully. While members of the PLC team may think there is agreement on what needs to be done to improve the classroom instruction and increase student achievement, members often have very different ideas about the priorities. 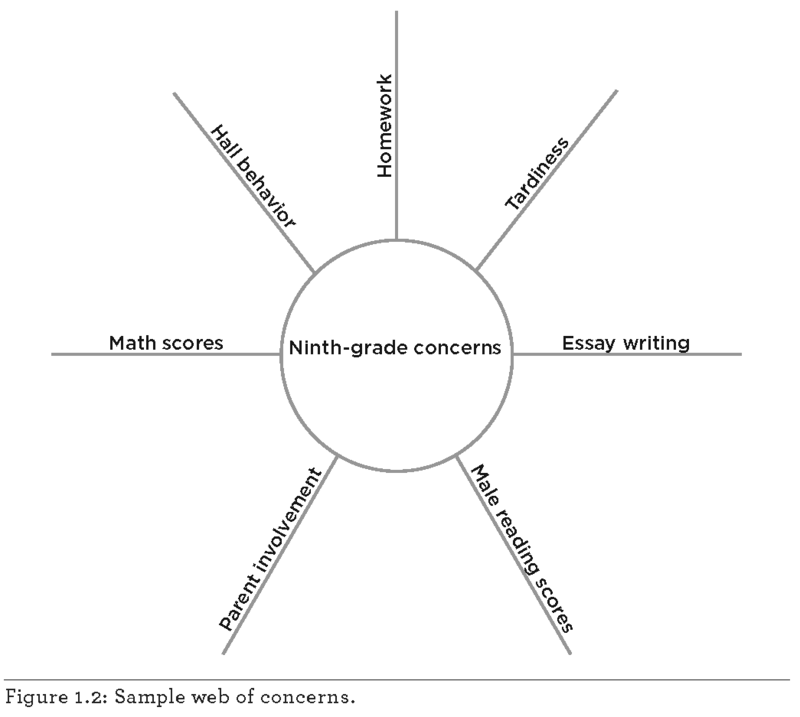 The Web of Concerns, a graphic organizer, defines the attributes of the topic in a visible way. The web focuses thinking inward toward defining the concern. Use the Web of Concerns as a way to expose the issues and to set the agenda. Students should always be the focus when teams set priorities. It’s that simple. Also, understand that the Web of Concerns may generate items that need several meeting agendas to address. To create a Web of Concerns, the facilitator draws a circle on the whiteboard, with a target phrase in the center, for example, Ninth-grade concerns. Members then contribute their thoughts to the conversation, and the leader records key words as lines or spokes stemming out from the edge of the circle, creating a web of ideas. Some spokes for this concern might be: tardiness, essay writing, math scores, male reading scores, homework, parent involvement, and hall behavior. Once the Web of Concerns is complete, the team prioritizes the concerns. These rankings may take many forms, but some helpful categories include: immediate action, action, needs study, and combine. This Web of Concerns often leads to the team agenda for the next few months. Teachers can easily use the Web of Concerns in classroom activities. They may delineate the attributes of a character in a language arts story, the resources of a region in social studies, or the characteristics of a mammal in science class. It provides a powerful graphic organizer that makes the thinking visible to all. Figure 1.2: Sample web of concerns.